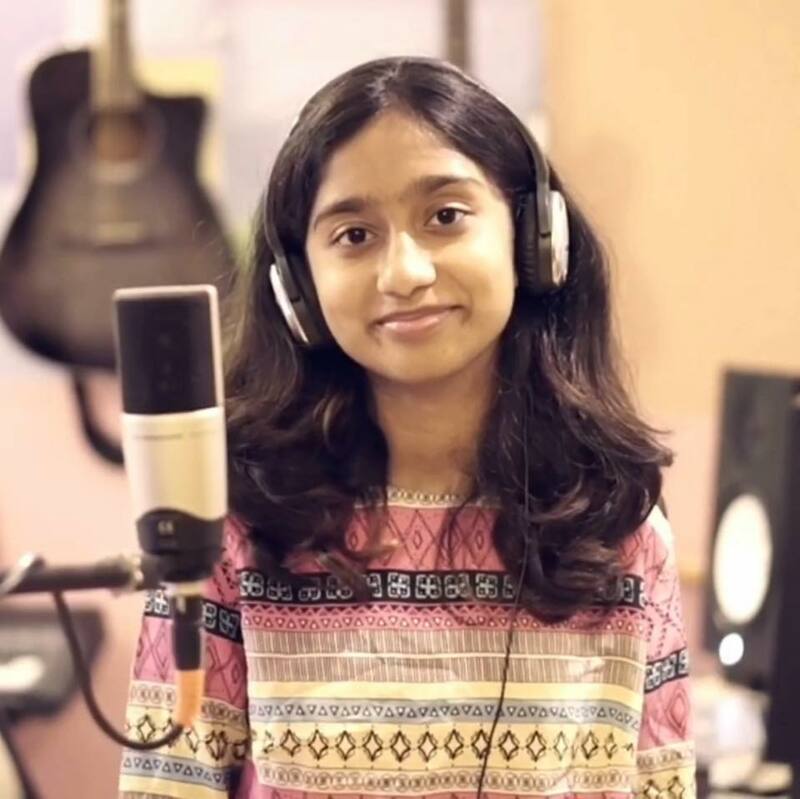 They say good things come in small packages and 14-year old Mia Makhija is heart warming and awe inspiring rendition of the same. She’s a singer and a songwriter who has just released her debut track titled ‘Speak your mind’ on multiple music-streaming platforms such as amazon and apple music under the moniker ‘Mia Makes Music’. Let’s be honest, at her age, most of us would probably be having the times of our lives on the playgrounds or experiencing the first symptoms of a ‘crush’. And of the hundreds of children who receive musical education at a young age from enthusiastic parents, only a handful of them have the determination, work-ethic and discipline it takes match their established peers. Mia is a rare talent whose first interaction with music happened literally ‘the day she was born’, in her own words. She credits her parents for the early musical influences that encouraged her to try and sing. I began training at a music school at the age of 8. I learnt vocals only, and a few years later I started learning the guitar. Ella Fitzgerald‘s ‘let’s call the whole thing off’ – a masterpiece from the queen of jazz herself was the first song that Mia had ever heard. Being exposed to tracks such as Etta James‘s ‘At last’ left a lasting impact on her. An endearing obsession for singing and a curiosity to learn and enjoy music was in her DNA. From vociferously singing nursery rhymes to never missing a single music class ( the ones we used to bunk ), she did all she could to explore her passion. Recognizing the importance of talent and a need for it to be nurtured Makhija’s mother enrolled her into a musical academy to receive a formal education. This was the stepping stone that the young starlet needed to train and harness the potential of her voice. Not being shy to let the world witness her talent she soon launched a Facebook page. That was quickly followed by her own youtube channel where her original compositions as well as covers of famous tracks; can be found. Mia’s voice has an unbelievably deep and mature voice that shadows her identity as one can easily mistake her for a top professional singer. But that wasn’t enough. An urge for being a multifaceted and original artist lead her to learn how to play an instrument. As a performer, I had to rely on someone to provide the music while I sang on top of that. This was a disadvantage for me as I couldn’t do solo performances, and had to put my faith in someone else for the music for every show and performance. So I picked up the guitar we had at home and began strumming some basic chords, and here I am! However at her age academics are equally important as well which is why her school has played an important role by being supportive along with her loving parents. Equipping Mia with her own home-studio along with the necessary tools and gear also enable daily sonic explorations and helps her channel her creativity in a constructive manner. For the time-being, the little prodigy is happy to learn the different facets of music from as many sources as possible and is in the figuring out a sound that she is comfortable with and wants to improve upon. Being unique is important to her as she wants to model her voice with learnings from icons such as Amy Winehouse, Diana Krall, Cyrille Aimée and Chantae Cann. As the word of her abilities and the sound of her voice spread, Mia soon found herself playing at venues across the city. She even earned a spot at Blue-Frog Bangalore and was invited to perform for a special ‘World Jazz Night’ at the venue. My most memorable performance would definitely be my performance at the Bflat bar on November 13, 2016. It was the first time I performed solo with my guitar. It’s definitely my favourite performance. So what does she do love doing apart from making music? “I love going diving! It’s definitely a life changing experience,” she exclaims. Mia Makes Music is certainly a name that you should have in your audio diaries as this ‘star-girl’ is definitely on her way to fulfilling her dreams.